It started as a simple black and white ink drawing on this ancient flat stuff called paper. Then what began as a quick sketch from life of my son (drawn in typical Silly Daddy Comic style) was revised and meticulously ran through a number of space-age computers. So now this creation has become a full color educational piece of rare digital art, showing the world the secrets of blockchain success. 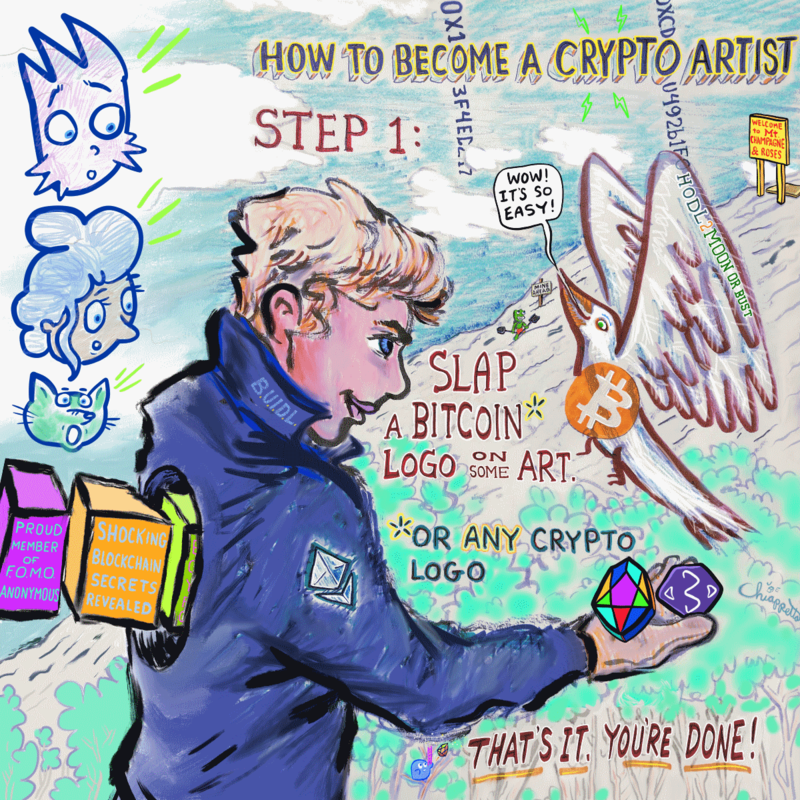 Viewers of this fine artwork can now discover exactly how anyone--with hardly any skills whatsoever--can become one of them fancy new crypto artists! Indeed, you too can be a blockchain rock star! You know you want that. Along with many other of my designs, you can find this very limited edition crypto collectible on the SuperRare market for rare digital art! I have sold a very good amount of crypto art on SuperRare and since these are one of kind editions of art, I really try to make sure I put top-notch designs here. Zooming in on at least three different areas of this canvas, you should be hit with a few pleasant surprises. There are mini bonus scenes in the background that people familiar with the rare digital art and crypto space will get an extra kick out of viewing. Please let me know which one is your favorite mini bonus background scene, as I enjoy making them. Perhaps I will make more in future pieces of art. Also in all seriousness, I have written a number of introductory crypto art articles. These firsthand art business reports actually do help a person learn more about the industry. They serve as guides in how to get started in this exciting new corner of the art world, full of short, as well as long crypto art market analysis. I also conduct public speaking presentations on crypto art, which I enjoy doing. In fact I am delivering a talk on opportunities for artists on the blockchain very soon at the University of Southern California for some graduate students. Perhaps we should call it Crypto Art College? While that is not (yet) the actual title of the event, I am looking forward to showing attendees how the cryptocurrencies of Bitcoin, Ethereum, Counterparty, BitCrystals, EOS, pixEOS and Steem can be used to leverage more exposure, community, as well as sales in the art market. This event is part of a business-of-art series for USC students and it is also open to the public!